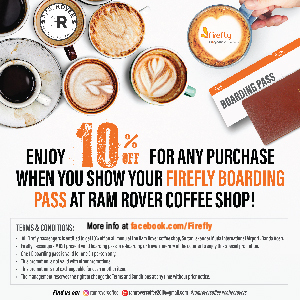 Enjoy 10% off for any purchase when you show your Firefly boarding pass at Ram Rover Coffee Shop! • All Firefly passengers is entitled to get 10% off on all menu at the Ram Rover coffee shop, Sultan Iskandar Muda International Airport, Banda Aceh. • Firefly passengers MUST present valid boarding pass or e-boarding or travel itinerary at the counter to enjoy this special promotion. • One (1) boarding pass is valid for one (1) person only. • This promotion is not valid with other promotions. • This promotion is not exchangeable for cash or other item. 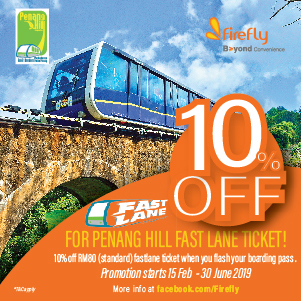 Enjoy 10% off when you flash your Firefly boarding pass at Penang Hill! 1. Valid for all Firefly passengers to the Penang Hill within the promotion period. 2. Firefly passengers MUST present valid boarding pass or e-boarding or travel itinerary at the Penang Hill ticket counter to enjoy this special promotion. 4. Applicable for Malaysia and International passenger. 5. One (1) boarding pass is valid for one (1) person only. 6. Promotion is valid from 15th February until 30th June 2019. 7. Not applicable during Weekend, Public Holiday and School Holiday. 8. Not applicable with other promotions and discounts. 9. This promotion is not exchangeable for cash or other item. 10. The management reserves the right to change the Terms and Conditions at any time without prior notice. Craving for Kampong Kravers? 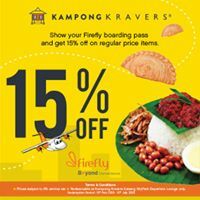 Show your Firefly boarding pass and get 15% off on regular price items! 1) Prices subject to 6% service tax. 2) Redeemable at Kampong Kravers Subang Skypark Departure Lounge only. 3) Redemption period from 15 February 2019 until 15 July 2019.